With the Smarter Balanced tests looming this spring, teachers are now being advised to give kids practice time to get used to the test; teach keyboarding, not for research projects--but for the test; order curriculum that helps with being comfortable online--for the test; teach writing--for the test; it is time to really start thinking about not only the increased cost to implement this test, but also, more importantly, the lack of validity and value that these tests provide to teachers and students. These tests have been piloted, but not calibrated. The Portland Public School Board has so far voted to not have the SBAC count as a valid measure in their Achievement Compact. The Oregon Education Association has been allowed by Arne Duncan to not have teacher evaluations tied to the results of the tests--yet. OEA members have demanded a moratorium on these tests until they are researched and evaluated. The tests are taking hours beyond expected. Students are overwhelmed and frustrated. Teachers have had little or no time to understand and learn what the SBAC expects, let alone teach students how to prepare for it--even though, many argue, teaching to a test isn't teaching authentically. And then of course, there is this: quality instructional time being lost in order to have students learn how to prepare and perform for a test that has no strong calibration set yet, has technological difficulties, is unreliable, and has an extremely high failure rate. So those that are truly left to struggle and feel the negative effect--are the children. The students. This is nothing but disgraceful. In light that the adults and school districts in this get a pass until the process is evaluated, one has to wonder why this is allowed? The only answer really seems to be that the testing company needs more data to strengthen their need to calibrate. This means, students are guinea pigs. The testing companies get to use our students to put their product on trial--at the expense of taxpayers, money not going into the classroom, and children feeling stressed and demoralized. However, until legislators, school board members, administrators, and superintendents start to question and stand up for our children (teachers have a harder time as they could lose their job) parents do have the power and the right to opt their child out of these tests. Check out our easy to access opt out information here. Oh, and enjoy the show of our Opt Out video that reminds us why opting out of high-stakes testing is important. Can You Judge a School By Its Report Card? A lot of people look at state report cards to a get glimpse of what a school is like, especially when they’re considering a new neighborhood. If you looked at the recent report card for Vernon Elementary, you might have been shocked or disturbed to see that our neighborhood school received a score of one, the lowest possible score. I am writing to tell you that this score is deeply misleading; it reflects not the caliber of the school but instead the defective nature of the state’s evaluation criteria. In case you haven’t spent time at Vernon lately, let me tell you a little about it. Vernon is a thriving, diverse neighborhood school. My two daughters go there, as do about 400 other children from this neighborhood. We have fantastic teachers, engaged parents, and dynamic students. We also have a International Baccalaureate program, a garden that stocks our cafeteria with greens, rich after-school offerings through our SUN school, and art, music, and Spanish and Mandarin language classes during the school day. This year, Vernon’s state report card score was docked two points from a three to a one. The reason is simple. A growing number of Vernon parents have – in protest – been opting out of the state’s high stakes, standardized testing protocol that ranks and punishes public schools. Whether you agree or not about the value of the testing itself, parents exercising their right not to participate is a punishable act under the current system. In the 2012-2013 school year, five students opted-out of testing. Last year, eighteen students followed suit. The state’s response to this small protest by individual families has been to deduct a point from the state report card for each year that families opted out. It has nothing whatsoever to do with the quality of education at Vernon. 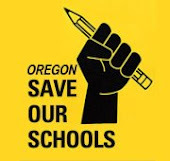 In Oregon, parents have the right to opt their children out of high-stakes testing, just as they have the right to opt their child out of any school activity they believe is harmful or inappropriate for their child. The reasons that parents make this choice are varied and personal, but in general, parents are acting on deeply-held beliefs about education and social justice. In opting-out of high stakes testing, Vernon parents are joining a much larger national movement to reject top-down education policies that are harmful to students and communities. Some parents opt-out of high-stakes testing because they don’t want to participate in a system that is undermining public schools. Since the No Child Left Behind policies of over a decade ago, states have been required to ramp up standardized testing to a level never before seen in American schools. The intent of these policies may have been to ensure a quality education for all students, but the result has been the opposite. One reason these tests are considered “high-stakes,” compared to past standardized testing, is because the fate of a school is tied to its scores. In the last decade, over 4000 public schools across the country have been closed using test scores as justification. The overwhelming majority of these closures have been schools that serve low-income families and students of color. A fundamental flaw in the system of judging schools by test scores is that test scores reflect a student’s family income more than it reflects the quality of their schools and teachers. Across all states, and all school districts, students in poverty tend to score lower than students with more home resources, even when those same students go to affluent “successful” schools. Yet, test scores are often used to label schools as “failing” or “ineffective,” and even to justify their closure or privatization. Some parents opt-out of testing because they do not want their child to equate their learning with a single number. Beginning in third grade, new tests this year are expected to consume eight hours per child each year. These tests create unneeded stress for students, resulting in a single label of “meeting” or “not meeting” standards. They also take away precious instructional time from meaningful learning experiences. Because of the high stakes for schools, testing encourages schools to narrow the curriculum to the tested subjects. Opting out of high-stakes tests is a concrete way for parents and students to voice their disagreement with these policies. I feel so fortunate to be part of the Vernon family. It is invaluable to have a great school within walking distance, to be part of a village of parents here in our neighborhood, and to see my children thriving academically and socially in our diverse and unique community. I am proud of Vernon parents for standing up against a system that is undermining public education. It is one more reason that I am proud to be an Owl.